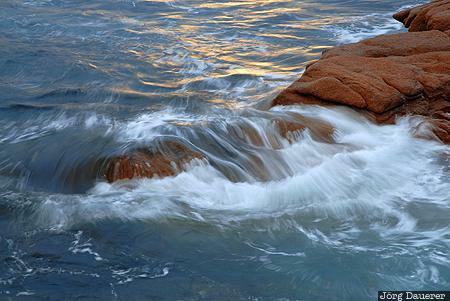 Water of the Tasman Sea flowing over the colorful rocks at Sleepy Bay in Freycinet National Park. The motion of the water is made visible by using a long exposure time. Freycinet National Park is in the south east of the island Tasmania, Australia. This photo was taken in the morning of a sunny day in March of 2007. This photo was taken with a digital camera.